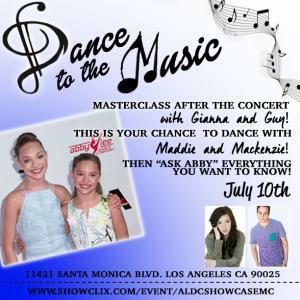 COME TRAIN WITH THE CHOREOGRAPHERS FROM LIFETIME'S DANCE MOMS LIVE! WITH SPECIAL GUESTS MADDIE & MACKENZIE! Take classes from your FAVORITES and the ASK ABBY ANYTHING after the Masterclass! AWESOME ALDC Tank Top included and PHOTO with Abby Lee Miller!! ALDC LA 11419 Santa Monica Blvd.